Not a lot more needs to be said. Turning Point: The pitching was terrific. The offense was crap. 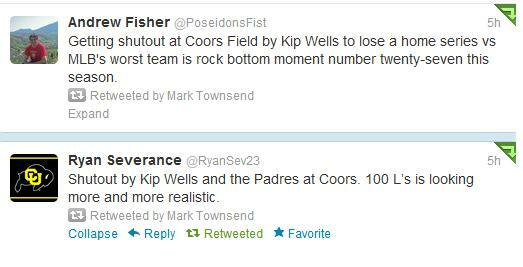 That must mean the defense played a major role in the Rockies defeat on Sunday. Of course they did. This time it was a total breakdown on the infield after a jam sandwich off the bat of Logan Forythe landed safely behind the mound, just out of the reach of Drew Pomeranz and Jordan Pacheco. Pacheco then scooped the ball and airmailed a throw over Jason Giambi's head for a two-base error. Chris Denorfia scored from second to give San Diego a 1-0 lead in the 3rd. That was seriously all the Padres needed, but they added an insurance run in the 7th just to be safe. Highlight of the Afternoon: There was ONE. It came via the arm of Dexter Fowler in that 3rd inning. Of course it falls right in line on the day Drew Pomeranz returns. The Rockies followed up a 10-18 May with a 9-18 June. It's almost impossible to believe they finished April at a very respectable 11-11, isn't it? Again, the Rockies record in 50/50 swing games looks a lot better than their overall mark because a high percentage of their losses are games they're completely out of early due to the starting pitching. Simply stated, this isn't your typical win 60, lose 60, how do they split up the other 42 games team. It's a win 50, lose 90, pray the offense keeps them from losing 100 team.